I have to say that normally I am not one to procrastinate. In fact I am the complete opposite; I am the one who gets started right away when items are presented to me and completes them early. Yet this year, I seem to be slipping into a pattern of putting things off until the last minute or simply just tired of looking at something. Such a slippery slope I am heading down and I do not really like it too much. Today, however I decided that it was time to take on some of those jobs I have not accomplished. I was able to paint the last drawer for the kitchen, pull the weeds in a few flower patches, shred a pile (and I mean a pile) of paper, clean out the laundry room, bag some clothes for Goodwill, make a pile of papers that will need to be filed and put fertilizer on my flowers. It was a packed day of getting items completed that should have been done in oh..ah…um... May. Ya know it was still a struggle to get them done. I honestly just wanted to curl up with my book in bed and tune out for the whole day. 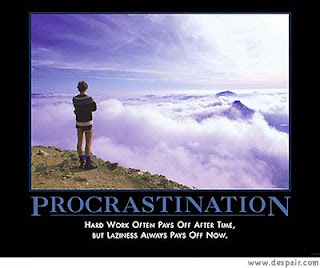 Hopefully, I am done with procrastinating for a bit of time. This may take some time….